Being released in the UK only for a price of £69 (about $110), there's little to separate the Kodak ESP 1.2 all-in-one printer from its stablemate, the ESP 3.2, which costs £79 in the UK and $99.99 in the US. Both offer wireless printing, plus scanning and copying. Setting them up with Wi-Fi is fast with the new ESPs, and both come Google Cloud Print-ready. 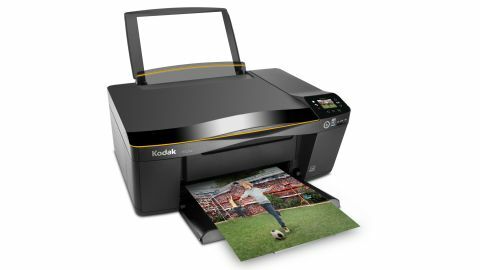 Neither printer is Apple AirPrint enabled, but downloading Kodak's free Pic Flick App enables wireless printing from an iPhone, iPad, Android or BlackBerry device. USB 2.0 connectivity is offered as standard, and each printer can read and write to SD, SDHC, MMC and Memory Stick. Both the Kodak ESP 1.2 and Kodak ESP 3.2 feature a rear paper tray that can feed the printer with up to 100 sheets of A4 (similar to US letter size) or 20 sheets of photo paper. Print resolution is pitched at 9600 optimised dpi for photos and 1200 x 1200 dpi for monochrome text. Both include a 1200 dpi optical scanner, with the option to scan images and documents to computer or memory card, and both can make up to 99 copies of a document in one go. In fact, the only distinguishing feature of the Kodak ESP 1.2 is actually quite a small one - the screen. It's approximately the size of an SD card, and inputting a wireless router's security code to access a wireless network using such a diminutive display and offset cursor keys requires painstaking precision. The Kodak ESP 3.2's screen is around twice the size, and offers a touchscreen interface that's much more user-friendly. The Kodak ESP 1.2's is clear enough to navigate, it's it's just not as comfortable to use. The Kodak ESP 1.2 is a comparatively compact all-in-one, measuring just 16.5 x 12.4 x 7 inches and weighing 5.1kg when full of ink and paper. A single-panel, angled rear paper feed folds out from the top, while the pull-out output tray is a small, three-stage design. Other than that, the Kodak ESP 1.2 is a typically black-boxy affair. The Kodak ESP 1.2 follows others in the range by using Kodak 30 series inks: a single-ink pigment-based black for text printing and a colour cartridge which contains three pigmented colours (cyan, magenta and yellow). As we've stressed in our Kodak ESP 3.2 and Kodak Hero 9.1 reviews, this single colour cartridge approach isn't ideal. Once one colour runs out, you have to replace the whole cartridge, even if the other two tanks have plenty of ink to spare. Supply levels can be monitored in the printer driver or on the printer screen itself. During our testing period, we managed to print approximately 30 A4 (roughly US letter size) photo prints, plus numerous black and white documents and photocopies before the colour ink supply was depleted to 1/3 of its capacity. Kodak's ISO Page Yield Test indicates that it's possible to print around 132 A6 (roughly 4 x 6-inch) photos before the colour ink cartridge needs replacing. Based on the recommended price of the standard 30 series ink tanks - £14.99 in the UK and $19.99 in the US - this puts the price per print at 11.5p, or 15 cents. Yields for black text pages are measured at 335 pages. With a standard black Kodak series 30 cartridge costing £7.99 in the UK and $12.99 in the US, this prices it at 2.4p or 3.8 cents per page. Naturally by buying online you can make considerable savings on the quoted ink prices, and opting for the larger XL 30 series tanks and Combo or Value Packs will shave even more off the total. This makes the running costs seem very reasonable.